I read this article and found it very interesting, thought it might be something for you. The article is called RHETORIC – The Game That Will Make Public Speaking Fun and is located at https://www.presentation-guru.com/rhetoric-the-game-that-will-make-public-speaking-fun/. Public speaking. The mere thought of it can set hearts pounding! And yet, being able to communicate one’s ideas in public is an important and sought-after skill. That’s one of the reasons why we created Presentation Guru: to have a forum where people can share ideas and insights that will make the public speaking experience better for speakers and audiences everywhere. While reading articles can expand your knowledge and expertise in important ways, ultimately, if you want to be a better speaker, you have to speak. Public speaking is a skill like any other. If you want to be a good dancer, you have to dance; if you want to be a good writer, you have to write; if you want to be a good speaker, you have to speak. The more you do it, the more you will improve. 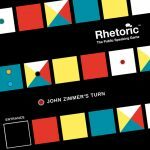 John Zimmer, one of the co-creators of Presentation Guru, and Florian Mueck, have created a board game that will help people become better speakers and have fun in the process: Rhetoric–The Public Speaking Game™. They have now turned the game into an app. 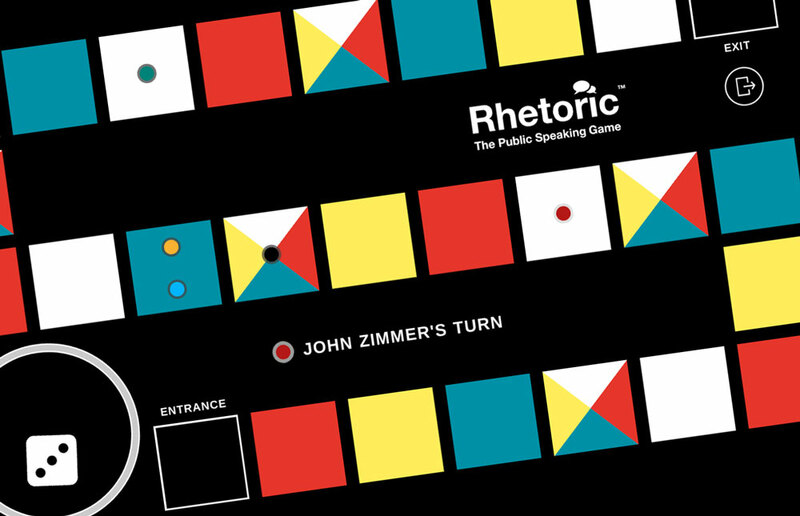 RHETORIC is a simple, engaging and educational board game for two to eight people. Players “step onto the stage” and embark on a rhetorical journey during which they encounter different speaking tasks. In each round, players roll the die and move their figures to the corresponding space where a one- or two-minute speaking task awaits them. Topic – Players draw a card with a single word on it. They must speak about the topic while incorporating specific content (as shown in the video below). Challenge – Players draw a card and answer a challenging question or respond to a challenging instruction. Question – Any player can ask the speaker a spontaneous question on any topic. The speaker must answer the question, structuring the speech in a specific way (as shown in the video below). Reflection – Players have “carte blanche” and can talk about anything. This is not a game where you can sit back quietly. With each turn, players must stand up and deliver their speeches to their fellow players. The game can be played competitively or not. If the former, then throughout the game, everyone rates the speeches given by their fellow players. Players are thus competitors and judges at the same time. One of the great things about the app is that it can be played in different languages. Currently, you can play RHETORIC in English, Spanish, French, German or Catalan, and more languages will be added in the future. In addition, themed decks of cards will be added to offer players a variety of games. The first theme will be the Family version; other themes in production include the Business version and the Travel version. To get a better sense of how the app works, here is a short video in which John walks us through it. The focus of RHETORIC is on having fun, but there is a serious side as well. If people can develop the confidence to stand up and speak in front of a small audience in a relaxed environment, the foundation is being laid for speaking in front larger audiences in more challenging situations. The importance of standing up and delivering even a one-minute speech should not be underestimated. It means one more minute of public speaking experience than you had 60 seconds ago. And the effect is cumulative; the more you speak, the more comfortable you will become at speaking. RHETORIC is being played in companies, organizations and homes around the world. The app is available in the App Store (for iOS) and on Google Play (for Android) so check it out. Editor’s note: April 2017 – the new Family theme is now available: new topics and challenges that are perfect for family members of all ages. Check it out!